Numark Mixtrack Pro 3 Review: The best DJ controller in its price range? 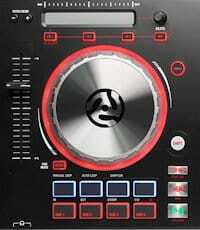 This is the Numark Mixtrack Pro 3 DJ controller. This controller made our list of the top DJ controllers of the year. It was our winning selection for DJ's on a budget and if you need a great cheap controller this could be for you. It comes in at a fantastic price and the last time I checked it was under $200! The Mixtrack Pro 3 is designed to work perfectly in conjunction with Serato DJ software. It comes bundled with Serato DJ intro to get you off to a start if you don't already have software. It will also work fine with many other programs like Mixxx which is free to download, and virtual DJ 8. If you're completely new to DJ controllers you should know that they need DJ software to operate. They do not accept CD's, but the software will let you play your music directly from your computer. You simply import your music library into the DJ software then drag tracks to the onscreen decks. You can then control the playback using the controller. Serato DJ is excellent and the intro version will get you started in DJing. But you will need to buy the full version if you want to unlock all of the programs features. Check out my article Serato DJ VS Traktor Pro 2. The article will give you a great overview of this software in comparison to it's main competitor. Before we get to the first impressions you're probably wondering who this controller is aimed at. As previously mentioned the Mixtrack Pro 3 comes in at a price of less than $200. This makes the controller well suited for DJ's on a budget. This low price could also be appealing if you're just curious about DJing and don't want to spend too much. If you've never tried DJing before how do you know you'll like it? It's also well recommended for beginners because of it's friendly layout. Or for people just setting up a mobile DJ business. 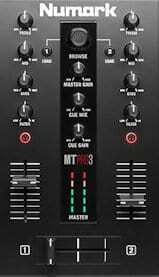 As soon as you look at the Mixtrack Pro 3 you see a quality that the previous Mixtrack controllers lacked. The older and very popular Mixtrack pro 2 did its job well, but it was very simple. It also looked kind of cheap and tacky. But as you take the Mixtrack Pro 3 out of its box it gives the initial impression that it would cost a lot more than you paid. It doesn't look at all cheap and is a big step up from the Mixtrack Pro 2 in terms of looks. It's also quite a bit wider and thinner with a width of 21.6 inches, a depth of 9.1 inches, and a thickness of just 1.1 inch. Although it's wider, the Mixtrack Pro 3 is still a very appealing size and fits into the smaller controller category. This makes it perfect for mobile DJ's and bedroom DJ's without much space at home. It has a plastic casing, but the word plastic shouldn't put you off. Many controllers use this very tough and durable high impact polymer composite. It saves on weight as controllers need to be light for transporting them to gigs etc. This is something else that keeps the mobile DJ's happy! The Mixtrack Pro 3 has a built in 24-bit audio interface (sound card). This will give crystal clear audio playback and also means that you won't have to buy separate hardware. You simply connect the controllers USB port to the USB port of your computer. This simple plug and play feature makes it easy to get yourself in the mix with no messing. You'll also see a set of RCA (phono) plugs to connect speakers/amplifier etc. On the front left of the controller you get a 1/4" jack and a 1/8" mini jack input for your headphones. It's great to have the option of both! And over on the right there's a microphone input with a volume knob. Very simple so far but things get more interesting up on the top! If you've previously used the Mixtrack Pro 2 you'll instantly notice how much bigger the pitch sliders are on this model. The upgraded sliders now have a whole 100 mm of travel! This sets them ahead of the competition as you'll find most controllers in this price bracket have 60 mm sliders. This makes the Mixtrack Pro 3 just awesome for manual beatmatching allowing super fine adjustments. And it means you can beatmatch much quicker leaving you more time to enjoy the many other features. The next stand out feature is the large 128mm touch sensitive metal jog wheels. These can be placed into two modes using the wheel button. The first mode will operate just like a normal jog wheel. This allows you to touch them to stop a track and nudge the beat etc. They are also more than capable of scratching in this mode and are not at all laggy using Serato DJ. The second mode will allow you to bend the pitch of the track by simply turning the platter. This can also be done using the buttons at the top of the controller. Next you'll see a set of 8 performance pads per deck. The bottom 4 control cue points that you can set throughout a track. The top four will control your loops, auto loops, and assigned samples. The pad mode button above them is used to set the function you wish the pad to perform. To the right of these you have the standard play/pause, cue, sync, and shift buttons. If you haven't used sync before it is used for auto beatmatching your two tracks. A great function for beginners or people that just need more time to use the other functions etc. The shift button allows you to activate the secondary functions of the buttons (The text printed below the button). The last feature of the deck section is the touch strip at the top. Numark call this the strip search function and it allows you to control the parameters of effects. These effects are chosen using the software and assigned to the buttons below the strip. You can also hold the shift button while moving your finger along the strip to scan through a music track. This is great for jumping to a certain point of a track without having to use your computer. The crossfader is nice, smooth, and loose and will work great for mixing and scratching. The up faders are also smooth, not as tight as I'd like but they're OK.
Up above you'll see a button that will swap the cueing over in your headphones. Or you can hear both tracks with both buttons pressed. Moving on up you get a 3 band EQ with a low/high pass filter per channel. The filters are used to filter out low or high frequencies in a track and come in useful during mixing. In the centre you have a library browse knob to search for, and select your next track. This makes it easy to find tracks without having to use your computers mouse or track pad. Below that you'll see the master gain to control your main volume to the speakers. And your cue mix and cue gain for controlling what deck you predominantly hear through your headphones and its volume. Lastly there are a set of separate channel VU meters to get the levels set right as you mix. This prevents audio clipping and distortion which can damage your speakers and equipment. Overall I think the Mixtrack Pro 3 will be a great choice of controller for aspiring DJ's. If you are a beginner the simple layout will be pleasing to the eye compared to some more cluttered controllers. And this could definitely work for you if you're a beginner DJ just setting up a mobile DJ business. Once again bear in mind that this only comes with Serato DJ intro. So a further software purchase will be necessary if you want the full Serato digital DJ experience. But don't let that put you off.. We mentioned earlier that the Mixtrack Pro 3 will work with many other programs, even free programs like Mixxx! If you want a budget controller that comes with full software you will have to pay a little more. So you might consider the Pioneer DDJ-RB. Pros and Cons of the Numark Mixtrack Pro 3. Simple layout perfect for beginner DJ's. Light but robust, perfect for mobile DJ's just starting up. Great jog wheels, super responsive and scratch capable. Priced under $200! This opens up the doorway for many new DJ's on a budget. Crisp and clear sounding audio. Long pitch faders which outshine the competition. When used alongside Serato DJ this will grow with new DJ's as they progress. Not supplied with full software. Touch strip has limited functions. Library browse via the touch strip would have been nice. Thanks for checking out my review, if you're after a more advanced controller check out the Pioneer DDJ-1000. It's the controller I'm currently using and I think you'll like it, my full review and run through is > HERE. The definitive guide to DJing for beginners > HERE. And if you're on a budget you'll definitely need this to help you get the most out of your money > CLICK HERE.